Did you know that there is a new hand signal in the diving world? A group of Dutch divers, diving companies and the Plastic Soup Foundation invented a new hand signal for divers: the P for Plastic. Every year, thousands of marine animals get caught in plastic or mistake plastic for food and die out of starvation. The plastic soup is also causing coral reefs to get sick because plastic works as a magnet attracting toxins. 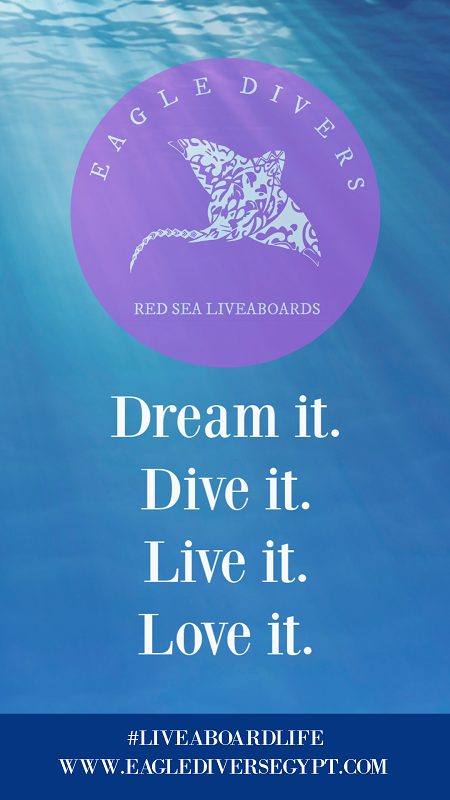 It’s a disaster for underwater life and a threat to what we love doing – diving! Divers use underwater hand signals for squid, turtles and sharks, but not yet for the largest polluter in our ocean – plastic. If nothing changes, by 2050 there will be more plastic than fish in the ocean. As a diver, you are constantly confronted with the ongoing decay and damaged state of the sea and the coral reefs. This is why a group of diving companies and divers, together with the Plastic Soup Foundation, are introducing a new hand signal: The P for Plastic. This signal can be used by divers under water to let their buddies know that they see plastic and they want to pick it up. 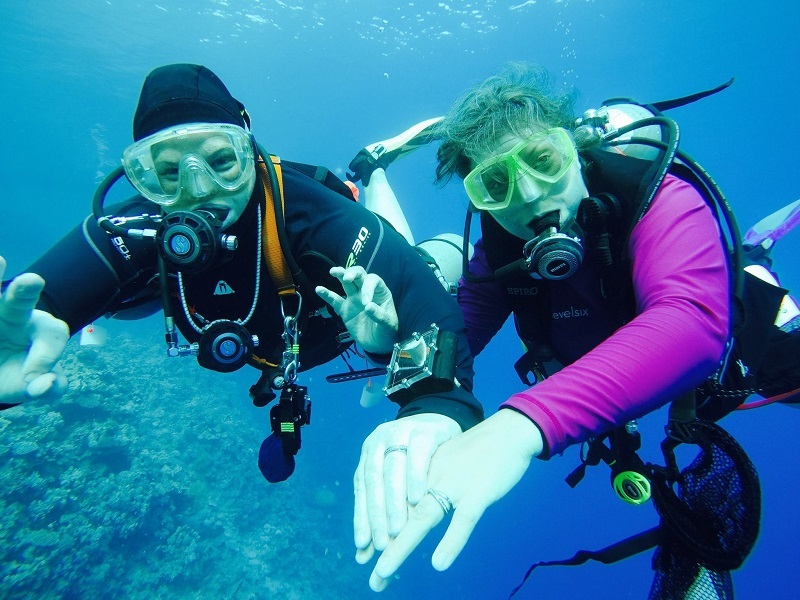 The goal of this hand signal is to encourage as many divers around the world to spread awareness and take action against the plastic plague that our ocean is facing right now. 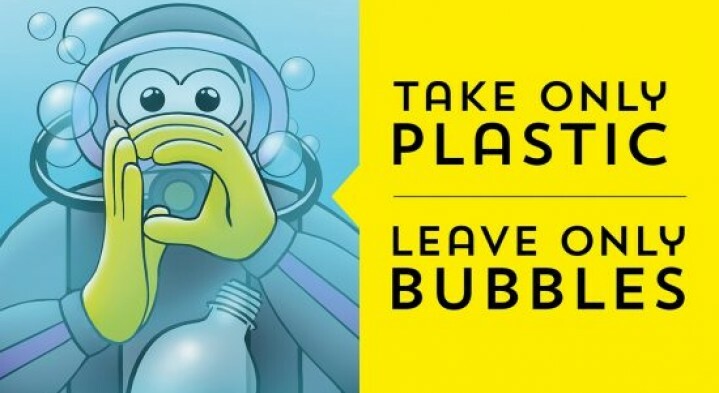 You can help spread the word by sharing the picture on social media using the hashtag #PforPlastic, print and hang the poster in your dive center or use and teach the hand signal to other divers. Find more information about what you as a diver, dive pro or dive center can do to stop plastic pollution at the Plastic Soup Foundation and at our Mission Deep Blue Program. 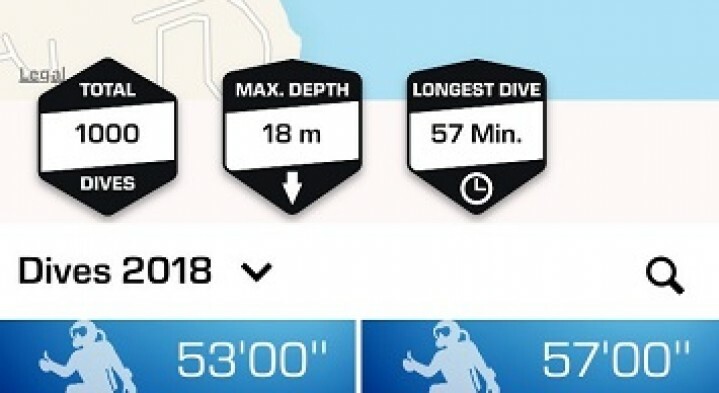 There’s a great number of apps out there that allow you to digitally log your dives, with one we especially like - the MYSSI App! Now before you say it, you do not need to be an SSI diver to use the dive logging facility and what you may also be surprised to find, is that you’ll also have access to some free course material in case you want to ‘try before you buy’. ‘I don’t want to see a shark’, ‘I want to see a shark’, ‘when is the best time to see sharks’, ‘can you promise me sharks?’…….we hear these statements and questions a lot in our job! When you’ve never seen a shark before there is the excited anticipation of not knowing what to expect or how the shark will interact with you which can lead to some hoping to not see any whilst diving. In response to this we always tell divers that the shark is way more scared of you than you are of it, really! 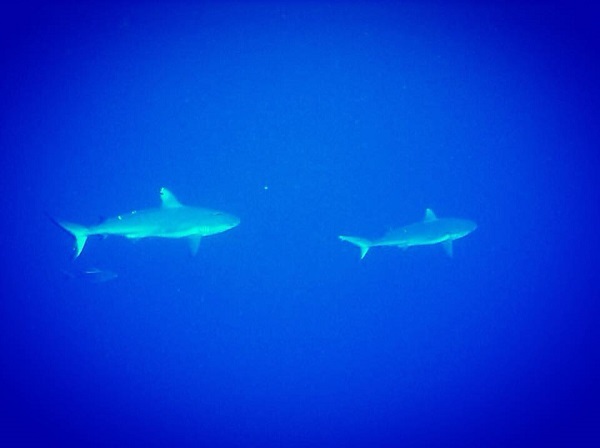 We’re noisy underwater, with all that expelled air and movement, sharks are not likely to hang around much more than a minute of two once they spot you, preferring instead to head back down to the deep for some peace and quiet. 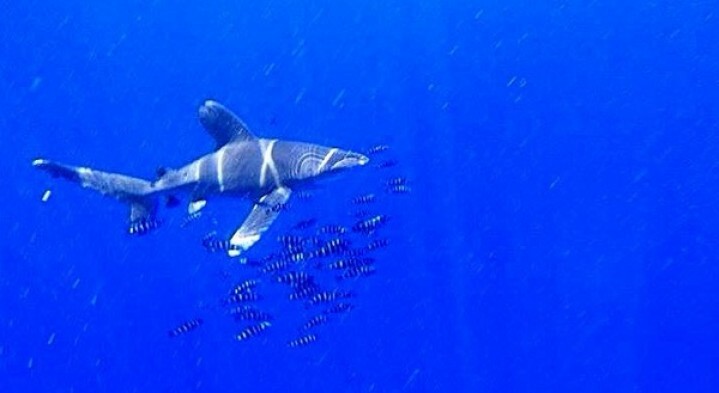 But say you do want to see sharks, is there a best time to visit the Red Sea to optimize your chances? The answer to that is yes, and no. We make a point of NEVER promising a specific under water sighting as it’s a big sea out there and fish like to swim 😉 That being said, there are a couple of more popular areas where seeing sharks are more likely. Up in the North you can expect to see white tip reef shark quite frequently throughout the summer months, and surprisingly to most people local coastal dive sites often deliver the most sighting, with Ras Katy a favourite but if you’re headed out to Tiran and have the necessary qualification to go a little deeper, you may also have some luck at shark pool in Gordon Reef, that can deliver a thrilling dive with sweeping currents to add to the excitement. If you are a girl that scubas and you haven’t heard about GTS where have you been hiding? 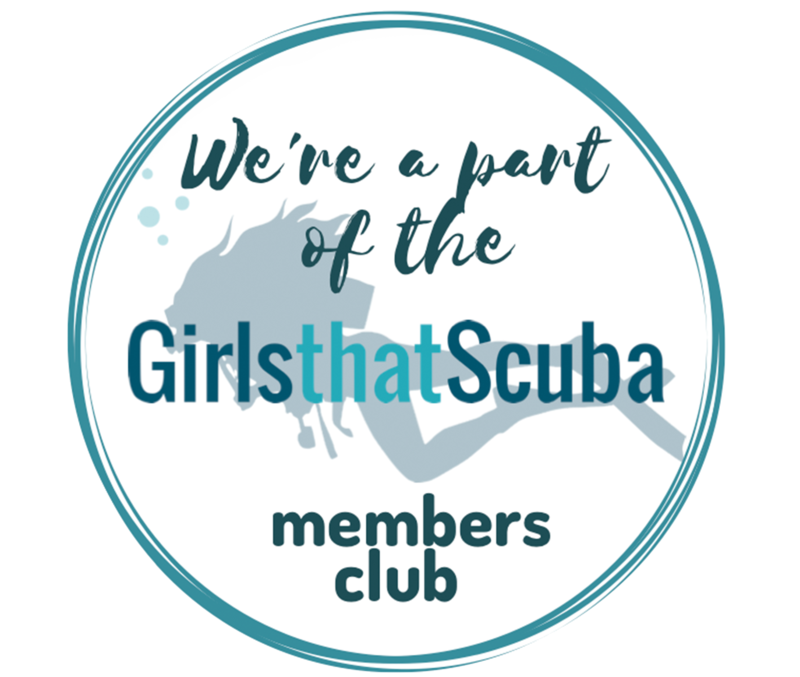 It basically started off as a small network of girl divers that has pretty quickly grown in to a huge global network of female divers, with dedicated facebook groups (over 30,000 members!) 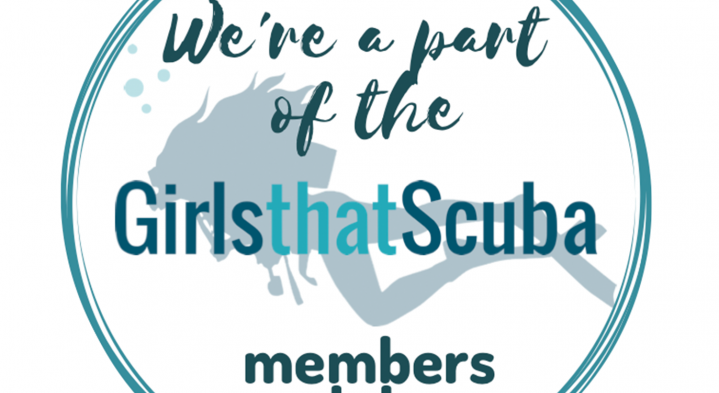 covering everything from dive shop and liveaboard recommendations, mums that scuba, dive brand recommendations, and now includes both girls that tec and freedive. The pages are a friendly place to go for advice and tips for all things scuba related (and some not so related) plus there are organised meet ups all over the world. A new year, a new look for Eagle One! Our beloved dive boat has been treated to a well deserved make over. After working hard in her first year with us, we decided during the obligatory dry dock period to treat Eagle One to a makeover and give her a little extension at the same time. Starting from the sundeck, additional seating has been added towards the back with an extension of the canopy to provide more shaded area which as you can imagine is especially useful during the hotter summer months. There is however, more of an opportunity to sunbathe as the loungers in front of the captains chair have also been extended with brand new comfy cushions for your added comfort. 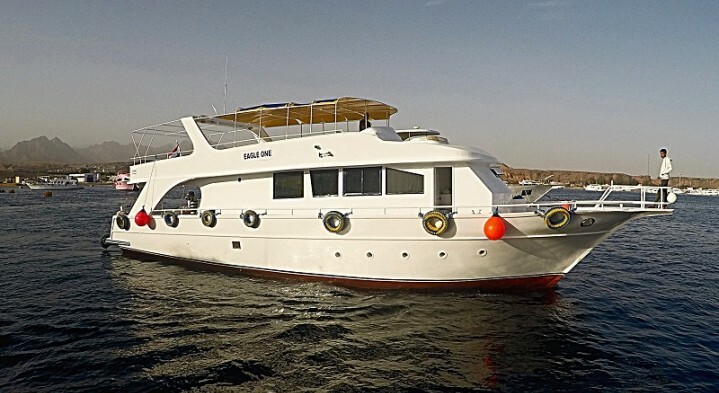 Northern Red Sea Liveaboard – Wrecks and Reef + 30% course discounts! Whether this is your first liveaboard or 100th, a diver or not, we guarantee you won’t be disappointed with the quality of dive sites and service provided! BOOK NOW to experience it for yourself. 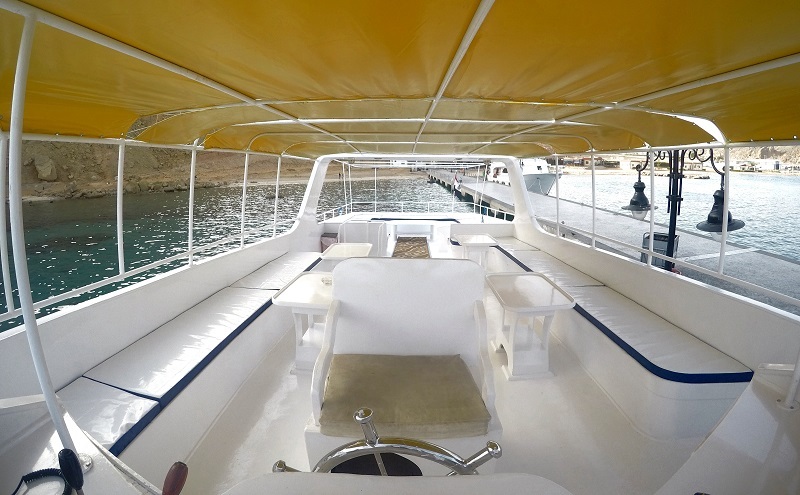 Come and live with us for a week between 28th April and 5th of May and enjoy exploring the wonderful Northern Red Sea dive sites from the comfort of a spacious liveaboard boat, transfers, all dives, meals and accommodation for only 830€ for divers or 630€ for snorkelers / non-divers. 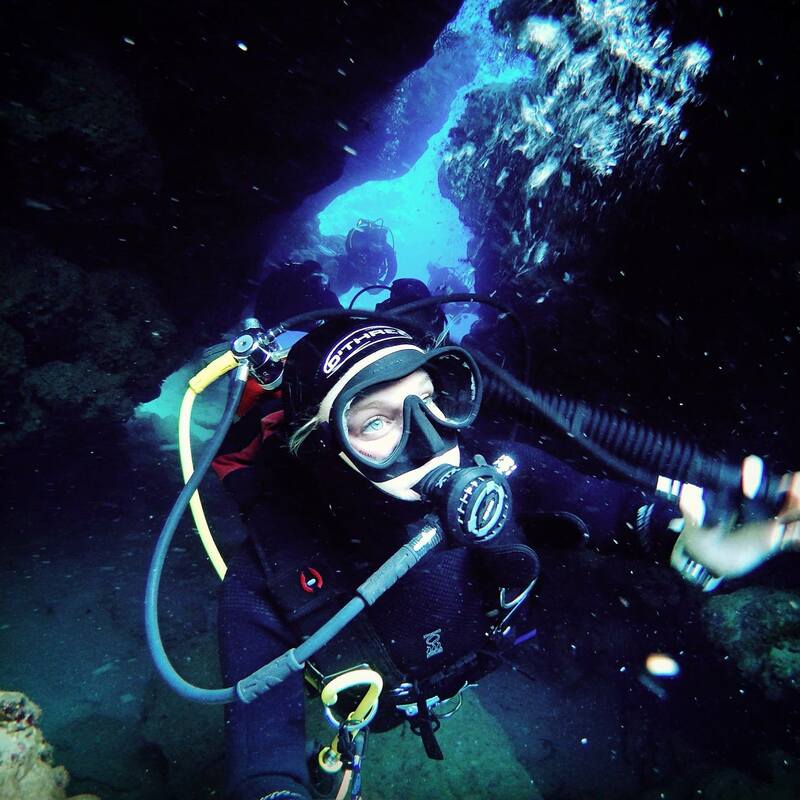 Scuba diving liveaboards are a great way to explore farther off dive sites and maximise your diving opportunities as you’ll literally be eating, sleeping, diving for 6 days straight. There’s no better way to wake up than with a dawn dive, surfacing to a full cooked buffet breakfast and steaming hot cup of coffee. You can then spend your surface time sunbathing, snorkelling, reading or generally relaxing on the comfortable sun loungers in between dives. Between the second and third dive you’ll be served a buffet lunch and then brace yourself for more tasty snacks after the 3rd dive as we watch the sun setting in preparation for the night dive; followed by another buffet meal, delicious dinner…...just as well diving burns calories with all this food! 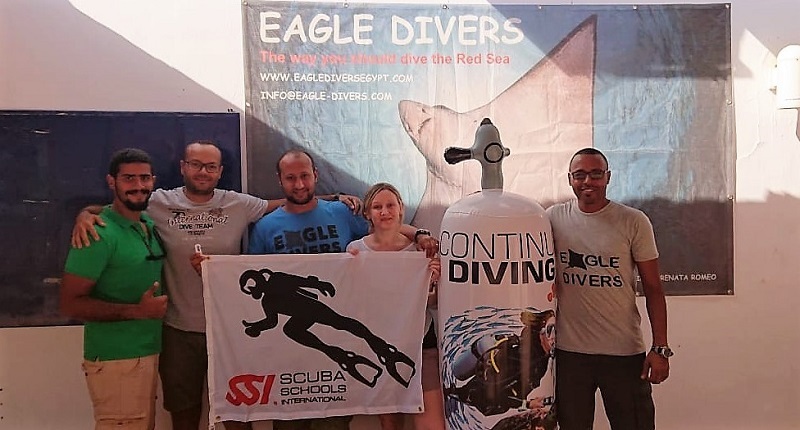 SSI now available in Eagle Divers Egypt! 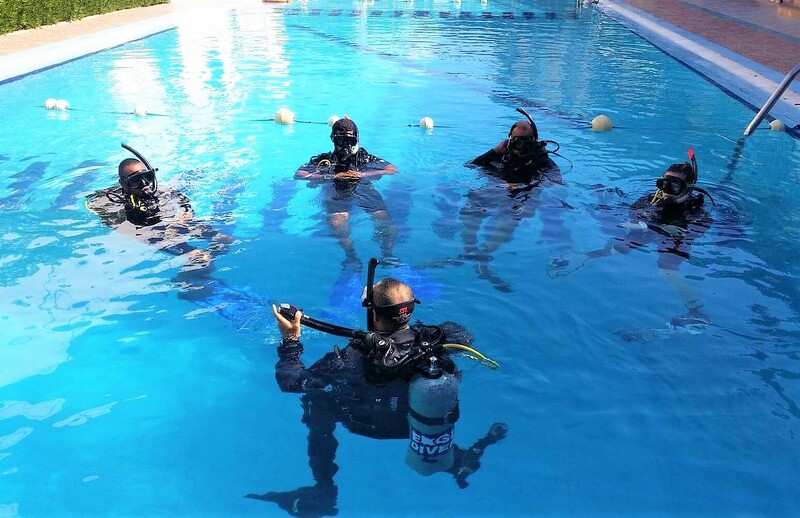 We've joined Scuba Schools International, read on for more info! 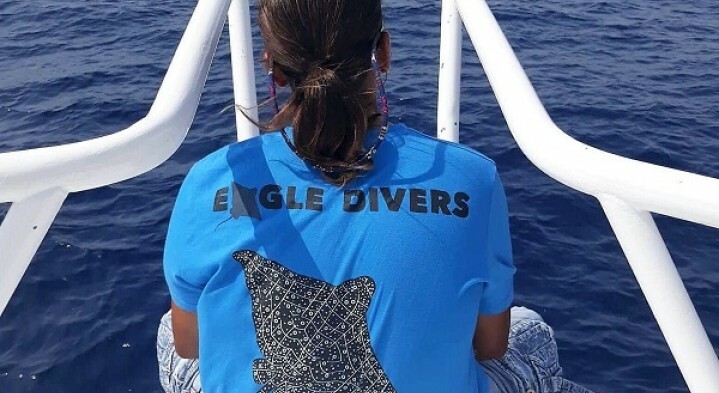 We are happy to announce that as of November 2018 Eagle Divers will also provide SSI courses and services to our guests! 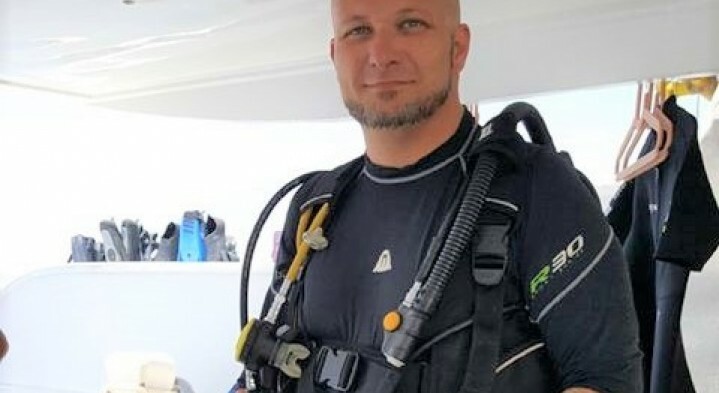 We have always recognized divers from other training agencies however to stay current and to be able to meet a growing demand for a variety of courses, our Instructors have successfully completed the SSI Crossover meaning we are now able to offer both PADI and SSI courses in a variety of different languages. Special thanks to Karim and Ramy from SSI for their time and expertise, we're looking forward to being part of Scuba Schools International! Shiny new reusable water bottles! We're done with single use plastics, can you be to! Being in Egypt unfortunately we are a little behind in the recycling and push for products which are more environmentally friendly, however changes are starting to be made and with videos circulating on social media of sea's full of plastic, or marine life caught in ghost nets or chocked on ingested plastic, more and more people are realising how important it is to change habits and help protect the marine environment. 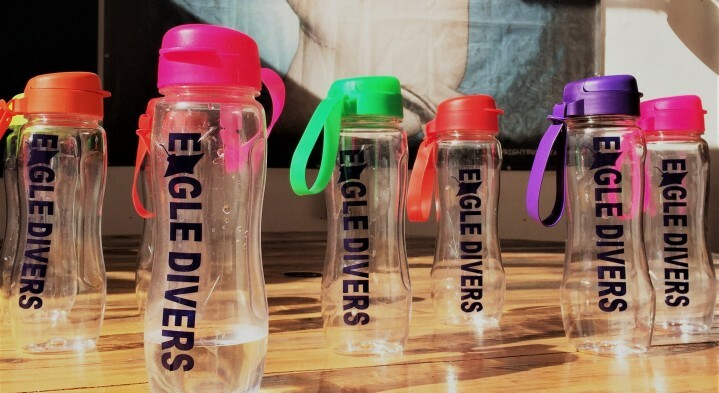 One small change which will hopefully have a big impact is that we've now ditched single use plastic cups so that you'll only be able to refill water bottles or use the ceramic cups in the dive centre and onboard Eagle One. Don't worry if you don't have a reusable bottle, you can get one of our shiny new bottles for only 5 euro! Better still, with every bottle sold 1 euro will go to Project AWARE and another euro to our local Hyperbaric Chamber, every little helps! If you have other ideas to help us reduce our environmental impact feel free to get in touch, we'll do all we can to help preserve our underwater office! Read on to find out which design will be featured as our next dive centre t-shirt! The votes were counted, and it was a very close call, but congratulations to Jimmi Bo Lund Eriksen from Denmark with design number 2, you are our winner! This was our first ever competition and we really appreciate the level of interest and submissions that we received from everyone, so a big thank you to everyone who took part. The t-shirts will be getting put in to production soon, with the finished product available hopefully before Christmas time. 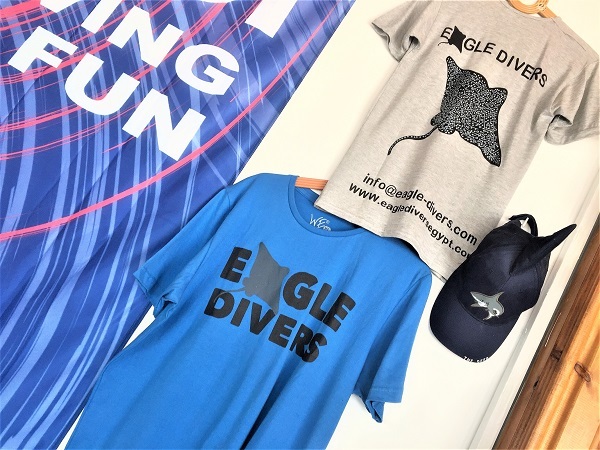 Keep your eyes peeled for more Eagle Divers goodies available in store soon. Congratulations also to Kelly Seymour, you win a free t-shirt just for liking and sharing our original post! We need your creativity! Submit your designs to win our next dive centre T-shirt! When great minds work together, wonderful things can happen! 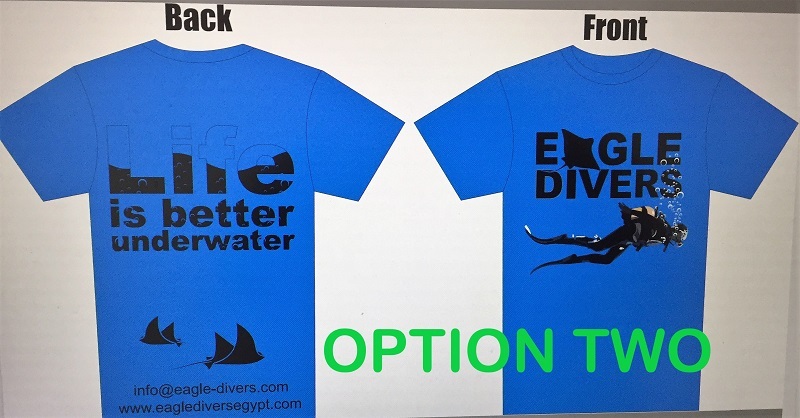 Each year we look to refresh the diving centre’s T-shirts but we thought we’d mix it up a little as we always hear such good ideas from you guys…..so this year YOU are going to design it for us! And better still, if your design wins you get a mention on the T-shirt itself and of course a free t-shirt* for your efforts! Needs to be related – a design with a dinosaur on ski’s would be cool for sure but doesn’t really scream diving and snorkelling so we’re hoping for designs that can at least loosely be tied in with what our jobs involve and possibly our name also. A sketch on a piece of paper with a bit of a description to accompany works just as well as a professionally laid out design. You do not need to have been an Eagle Divers guest previously to enter so if your granny, 2-year-old, or friend of a friend have some great idea’s they’re more than welcome to enter also! *As you can imagine the postal service is a little slow here in Egypt so we’ll aim to post it from the UK instead. For this reason there may be a slight delay getting it to you but rest assured you’ll be one of the first to receive it. **winner will be chosen at random after the competition closes. 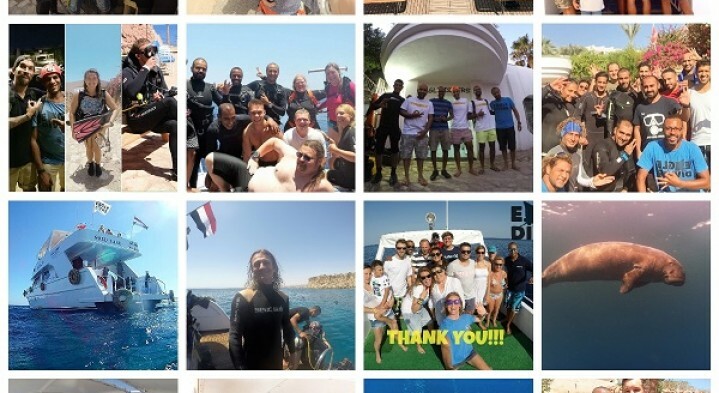 Blue Whale, Mola Mola & Tiger Sharks the highlights of the Red Sea! As a dive guide there are some creatures that you can almost 100% guarantee to your guests that’ll you see during a dive, for example the anemone fish in Ras Umm Sid, blue spotted rays in Yolanda Reef or the super ancient moray eel that is normally chilling around Gordon Reef. Then there are the quite common but never guaranteed sightings like turtles, eagle ray and white tip sharks, as guides we know the sights we’re most likely to see them at but we never make a promise as it’s a big ocean out there. But 2018 has already thrown quite a few unusual, and even extraordinary, sightings! Imagine you’re on a dive and a big dark shadow makes its way towards you. You try to figure out just what it could be, nowhere in your imagination would you consider it to be a Blue Whale right! !...Ok so we didn’t actually experience this, but definitely thought about it a lot since the blue whale sighting back at the end of May. 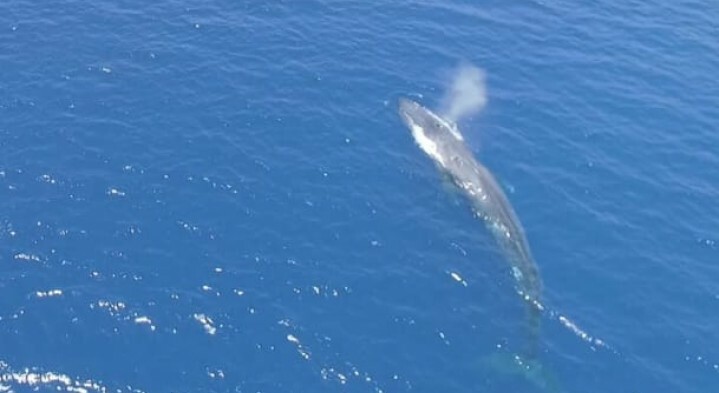 This was the first time a blue whale, the largest of all animals has ever been spotted in the Red Sea and experts can’t explain what it was doing here as they normally shallower, enclosed seas. It’s been a while now since its been spotted so we’re hoping it’s found its way out to some deeper cooler waters. 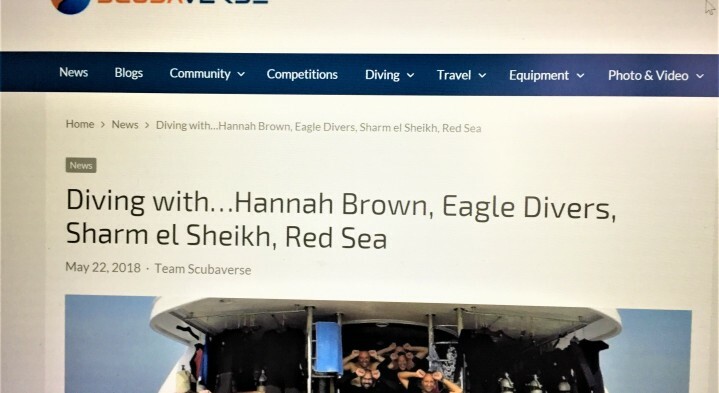 Read on to get to know her and Eagle Divers better! 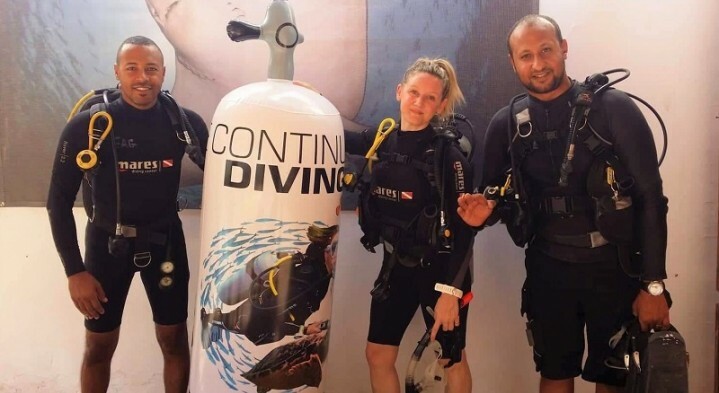 Scubaverse, the go-to-place for al things SCUBA related, recently caught up with our instructor Hannah to find out a little more what it's like to what in a diving centre and more specifically what the Red Sea has to offer in terms of diving holidays. Check it out HERE for the full article. We’ve upped tanks and moved dive centres! 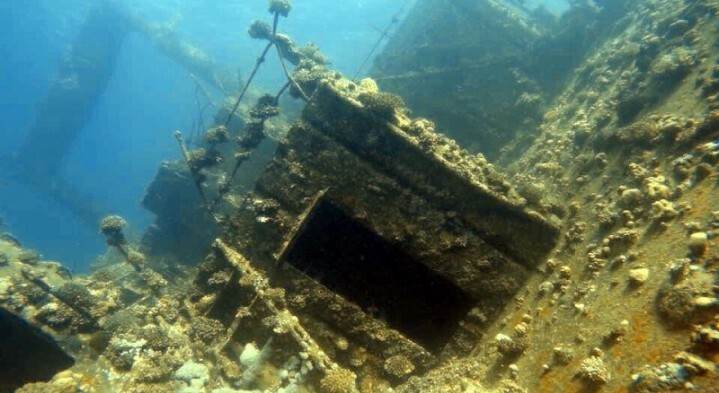 Read on for more details on this exciting news and some unmissable dive & stay offers! We’ve upped tanks and moved! It might seem like only yesterday we announced we’d moved to a new dive centre, but in actual fact that was almost 2 years ago now, doesn’t time fly! We’ve had a great time in the previous base and it has allowed us to make many improvements and meet a ton of new people which we’re really grateful for however it was never going to be our ‘forever home’. 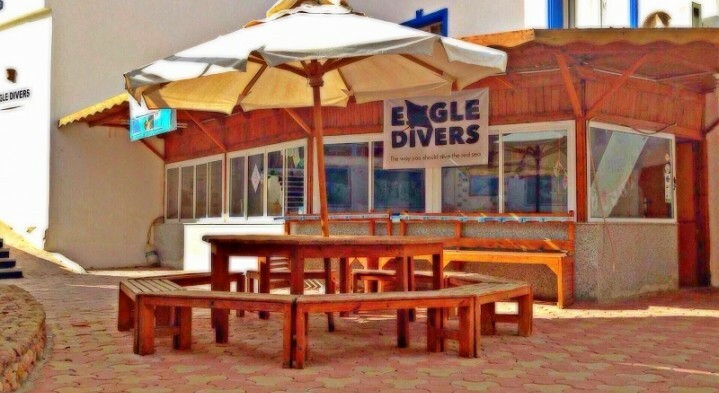 So when the opportunity came along to move to a new place which is a lot bigger, logistically easier and better located, we decided to jump right in and grab it…..so, welcome to Eagle Divers located in Naama Blue Hotel, Naama Bay! It’s been a busy time the past few weeks with paperwork procedures and moving but we’ve finally moved in and starting to add the personal touches (so if you’re due to visit in the next few weeks, bear with us 😉). OUR TOP 5 MOMENTS FROM 2017! As another year comes to an end, we’ve way too much to be thankful for, and not enough time or wordcount to list everything. OUR TOP 5 FROM 2017! As another year comes to a close (seriously how quickly do they pass?) we’ve way too much to be thankful for, and not enough time or wordcount to list everything. Instead, we’ve chosen our top 5 highlights from the past 12 months to share with you as just a small example of how great 2017 has been here at Eagle Divers. We can only hope for more of the same in 2018! It won’t come as a surprise that the dives and marine sightings this year make our top 5, it’s why we love our job so much. 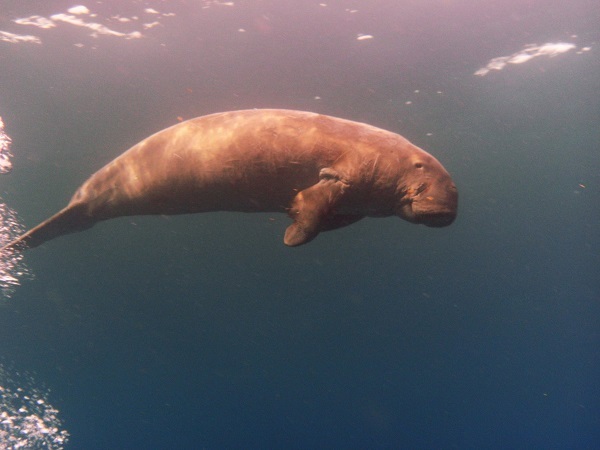 We’ve been privileged to have seen almost everything you could hope for as a snorkeler or diver, including schooling hammerheads, dolphins, big manta, whaleshark and of course the completely unexpected dugong. One thing is guaranteed for 2018, as long as we keep diving in the Red Sea we’re going to keep having amazing underwater encounters! 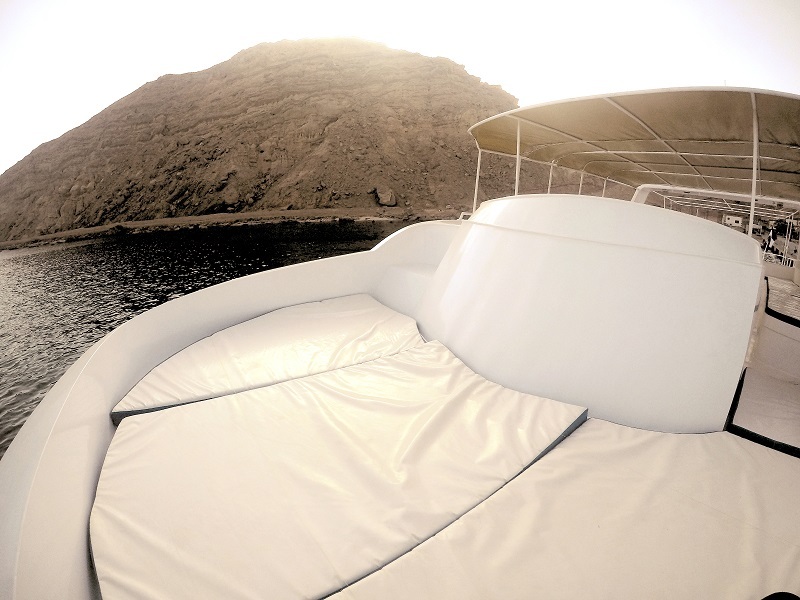 Check out the latest offers avilable on different dive & accommodation packages, with something to suit all budgets. As many of you are booking your own flights separately from accommodation and scuba diving packages, we’ve put together a summary of some package deals in Sharm for the coming season. From 5-star beach front hotels to self-catering studio apartments on purpose built complex, hopefully there’s something to suit every budget and with airport transfers courtesy of the diving centre bus, all you need to do is a book a flight and leave the rest to us. 7 nights accommodation in a shared double room on a half board basis + 5 days diving (10 dives) = £380 per person. All accommodation rates are provided directly from the hotel and may change depending on requested dates. The most accurate costs will be provided at the time of booking with no deposits required but full payment made during check-in. Depending on the hotel policy a 14% sales tax may be applicable.